In the year 2005, Rtadhvaja Swami retired due to his doctor’s orders only weeks before the 2005 Summer Trip was scheduled to begin. Having realized the impact of these trips on the lives of young boys and in honor of Maharaja, his students decided to continue and share the valuable knowledge and experience with a new generation. The second generation leaders took the Summer Trip to the next level, adding and upgrading innumerable elements to the program. With great love and compassion, the leaders gave genuine attention and care to the boys, teaching them virtue and bestowing to them love for Krishna. 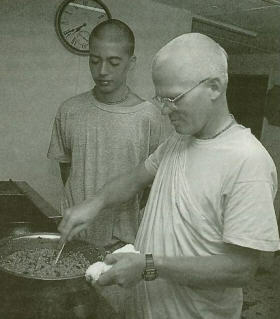 Krishna Priya always had the boys in his heart and in this way rendered great service to Srila Prabhupada. After many years of leadership, in 2013, the second generation leaders retired due to the approaching horizon only a few months before the 2013 Summer Trip was to be scheduled. Acknowledging the indescribable experience and importance of the trips, and recognizing the love their leaders had for them, the third generation has decided to receive the torch of responsibility to lead the newest generation. Headed by Krsna Kishor, the new organizers are all accomplished devotees within our ISKCON Society. The organizers began traveling with Krishna Priya in 2005 at the age of 12 and continued participating and helping organize until the present. 2013 Theme: "Sri Krishna's Pastimes"
Nightly ‘talks’ and group prayer before bed – talk and pray with boys about whatever they have on their minds. We visit many temples, ratha-yatras, and occasionally festivals. We do service and help out whenever and wherever we are needed.